Well, here we are... launch day! I have to say, I'm a bit in shock. When I first started this blog, I had no idea how far it would go. I made it on a whim, selected a design, and opened it up to contributors. I had no idea we would get to 150 posts, 14 staff members, and seven days a week of posting in just a few short months. It's been an incredible ride. Thank you from the bottom of my heart. With our growth, we've had to make some changes. As you can see, we've changed our design and URL. The original design wasn't working technically, so we've upgraded to a new one. We went through several designs before we found one that fit our vision, but we finally landed on something that works. This design features an option to comment using your Facebook, which is very convenient. And shiny. We updated our staff and submit pages, and made a blog button. 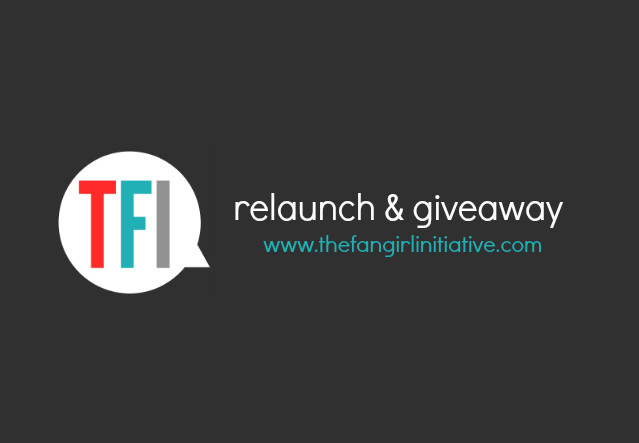 But perhaps one of the biggest changes is that we got a new URL: www.thefangirlinitiative.com. This marks a new and exciting era for TFI. We're so excited to show the new Fangirl Initiative to you! We're partnering with Kelsey Gulick's blog, Verbosity Book Reviews, to bring you a super-awesome launch week. This week, we'll be celebrating all things fangirl. We do this normally, of course, but this week is special. Expect posts about the art of fangirling and the fandoms that have our heartstrings, as well as our normal recaps & columns. Kelsey will also have posts up about fangirling, so be sure to check out her blog throughout the week. Along with posts, Verbosity Book Reviews and The Fangirl Initiative have partnered to bring you a giveaway! The giveaway will be open all week. 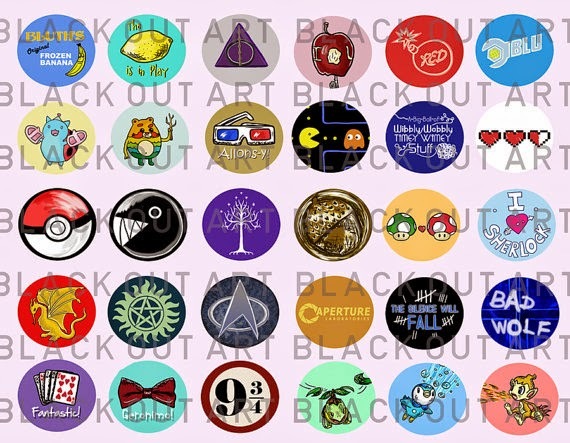 The pins are 1.5 inches and there are even more buttons to choose from in the shop! This giveaway is open to international readers. There will be two winners, one of each prize. Simply use the Rafflecopter below. There will be an option to enter daily, so be sure to check back! Thank you to both our contributors and our readers for making The Initiative a success. Here's to many more adventures together! P.S. - Stay tuned to our Twitter today for fangirly tweets every two hours. First of all, congratulations are in order because YOU'RE SUCH A GROWN-UP BLOG NOW. AAAAAH. It's just so amazing because even though I don't watch all the fandoms you post about, I still enjoy reading these posts and The Fangirl Initiative is an amazing fandom blog. Eagerly awaiting the fangirly posts of this week! Thanks, Alyssa! WE ARE SO GROWN-UP IT IS AMAZING. I'm so glad you like the blog and thank you for commenting! It means the world to us. Guys I'm so excited! I love the new design! It's so great to be able to go to TV Recaps and find my favorite shows instead of searching through pages of back entries... wishing you success! Thanks so much, Anna! I'm so glad it's more organized for you! Thanks so much for the well-wishes. I hope you have a fantastic day! Wow! What a super new site. Thanks to Verbosity for inviting me to join up. Thank you for the comment and for coming over from Verbosity! It's lovely to have you. YAY SO EXCITING!!! I haven't been reading as often as I'd like but I'm going to see if I can follow by email so I don't miss a post. ;-) The new look is so fabulous! Sounds good, Cait! I hadn't had the "follow by email" option up yet, but it's up now. Thank you so much for the comment! I am honestly WAY TOO FREAKING EXCITED ABOUT THIS WHOLE DEVELOPMENT GOSH. WOW!!! This is so exciting! Honestly, you guys are one of the very best blogs I follow. You were a dream come true for my fangirling heart when I found you a few months ago, and it's been so nice to see posts by other fangirls who are incredibly enthusiastic about their fandoms. Congrats, and keep up the incredible work! Congrats on the launch! I look forward to what is coming in the future! Thanks so much, Kelpie! We do too! This is such an awesome giveaway! Thanks for hosting it. :) The blog looks so great. Thanks, Hannah! It's our pleasure. You've been so faithful at leaving awesome comments--thank you for that! Hope you have a great day! This is my first time on this blog and it's seems pretty darned cool. I love this design you have now, though of course I can't compare it to the one you used to have! Congrats on the relaunch.